When you hear the name Elisabeth Kubler-Ross it's usually because of her influential work on death and dying. So you might be surprised to find her five stage model being used to understand change management. In 1969 Kubler-Ross described five stages of grief in her book "On Death And Dying". These stages represent the normal range of feelings people experience when dealing with change in their lives - or in the workplace. All change involves loss at some level. The "Five stages" model is used to understand how people react to change at different times. The stages were first observed as a human response to learning about terminal illness. They have also been used to understand our individual responses to all kinds of change. When Kubler-Ross wrote about these stages she explained that these are normal reactions we have to tragic news. In fact she called them defense mechanisms or coping mechanisms that we need to move through in order to manage change. We don't move through the stages one at a time, in a neat, linear, step by step manner. That would be far too easy! What happens is that we occupy different stages at different times and can even move back to stages we have been in before. Kubler-Ross said the stages can last for different periods of time and will replace each other or exist side by side at times. Let's look at how people react in each of the five stages. "I can't believe it", "This can't be happening", "Not to me! ", "Not again!" Denial is usually a temporary defense that gives us time to absorb news of change before moving on to other stages. It is the initial stage of numbness and shock. We don't want to believe that the change is happening. If we can pretend that the change is not happening, if we keep it at a distance, then maybe it will all go away. This is a bit like an ostrich burying its head in the sand. "Why me? It's not fair!" "NO! I can't accept this!" When we realise that the change is real and will affect us our denial usually turns to anger. Now we get angry and look to blame someone or something else for making this happen to us. What's interesting is that our anger can be directed in many different directions. I've seen people angry with the boss, themselves, or even God. In these tough economic times it's often the economy that is blamed. It's the government, or top management's fault for not planning properly. You might find you are more irritable towards colleagues or family. You'll notice others finding fault with the smallest things. "Just let me live to see my children graduate. "; "I'll do anything if you give me more time A few more years?" This is a natural reaction of those who are dying. It's an attempt to postpone what is inevitable. We often see the same sort of behaviour happening when people are facing change. We start bargaining in order to put off the change or find a way out of the situation. Most of these bargains are secret deals with God, others, or life, where we say "If I promise to do this, then you make the change not happen to me". In a work situation someone might work harder and put in lots of overtime to prove themselves invaluable in order to avoid retrenchment. "I'm so sad, why bother with anything? "; "What's the point of trying?" When we realize that bargaining is not going to work the reality of the change sets in. At this point we become aware of the losses associated with the change and what we have to leave behind. This has the potential to move people towards a sad state, feeling down and depressed with low energy. The depression stage is often noticeable in other ways in the workplace. People dealing with change at work may reach a point of feeling demotivated and uncertain about their future. I recently experienced a group of bank employees asking why they should continue to give of their best at work when they were unsure that their jobs were safe; and the bank was obviously not committed to them. My experience is that there is an increase in absenteeism at this time as people use sick leave and take 'mental health' days. "It's going to be OK."; "I can't fight it, I may as well prepare for it." As people realize that fighting the change is not going to make it go away they move into a stage of acceptance. It is not a happy space, but rather a resigned attitude towards the change, and a sense that they must get on with it. For the first time people start considering their options. I think it's a bit like a train heading into a tunnel. "I don't know what's in there, I have to keep going on this track, I'm scared but have no option, I hope there's light at the end..."
This can be a creative space as it forces people to explore and look for new possibilities. People tell me that they learn lots about themselves, and it's always good to acknowledge the bravery that acceptance takes. The stages of change are typically represented in the form of a change curve diagram. conveys levels of emotion or energy experienced by people as they deal with change in their lives. The Kübler-Ross Change Curve is Trade Marked (TM) by the Elisabeth Kübler Ross Family Limited Partnership. It cannot be used for commercial purposes without prior written permission and licensing from the Elisabeth Kübler Ross Family Limited Partnership. Unfortunately, using the change curve diagram can lead you to believe that the process of change is linear. It's easy to assume that the process of change begins with 'Shock' or 'Denial' and that it should end with 'Acceptance' after moving through each phase. Remember, Kubler-Ross emphasized that we move around between the stages. You may reach a stage where you feel you've accepted the change, but while getting coffee at work you hear news that throws you back into anger or denial. Moving between the stages is normal! The only time for concern is becoming stuck in one of the stages. 'Anger' and 'Depression' are two of the stages where people can easily get stuck. When this happens pay attention to what is happening in this persons life and help them to move on. If you are stuck in one of theses stages consider speaking to someone or meeting with a professional. Although she does not include Hope as one of the five stages in this model, Kubler-Ross adds that hope is an important thread running through all the stages. This hope is the belief that there will be a positive end to the change and that there is some meaning that will eventually be learned from the experience. In my experience this is an important indicator of our ability to successfully navigate change. Even in the most difficult circumstances there is an opportunity for growth and learning. And there will be an end to the change. Live, so you do not have to look back and say: 'God, how I have wasted my life'. Elisabeth Kubler-Ross, M.D.(1926-2004). When I use this model I find most people are relieved to identify the stage they are currently in as well as recognizing what they have previously felt. People identify with the stages from past experiences of change that might have been of a personal nature. It's also a huge relief to know that these reactions and feelings are normal and are not signs of weakness or that they are falling apart. 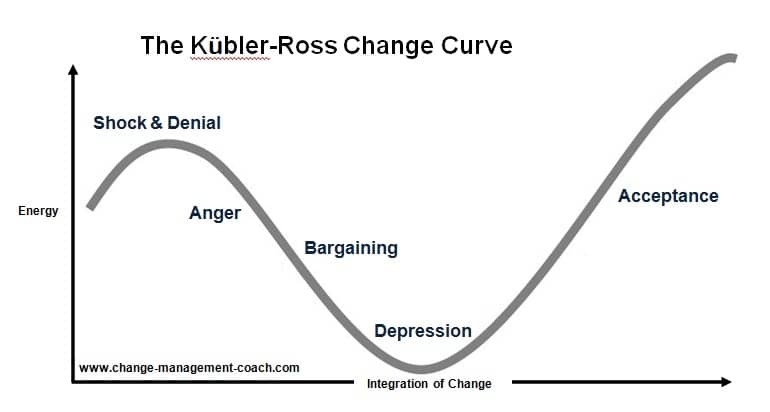 The Kubler-Ross model is very useful to identify and understand how other people are dealing with change. People immediately get a better sense of their reactions and why colleagues are behaving in a particular way. Not everyone agrees that this model is useful. It's main critics say the five stages are too simplistic and don't adequately describe the wide range of emotions people experience during change. The model is also criticized for making assumptions about broad applicability. Critics say it's unlikely that people all over the world experience the same reactions and emotions. To be fair though, the preface to "On Death and Dying" notes this and mentions that these are generalized reactions and people may wish to give them different names according to their experience. I have always found this model useful and use it because it's easy to understand. People are able to apply it in their lives and tell others about it as well.